LOS ANGELES -- This was the flashback lineup, which was a good thing for the Oklahoma City Thunder. Maybe it's a flash forward, which would be even better for them. The Thunder had their customary starters intact for the first time in more than three months in their playoff-like (and playoff-seed-solidifying) 107-101 victory over the Los Angeles Clippers, and served up a reminder that they deserve more than a mere mention in the championship conversation. Thunder coach Scott Brooks seemed so happy about it he kept the starters in down the stretch as well, scrapping his old rotation -- or at least the one we'd grown accustomed to. "It's been so long," Brooks said. "We knew that this day would come, that everybody would be together." Before Wednesday night, the last time Oklahoma City started Kevin Durant, Russell Westbrook, Thabo Seflosha, Kendrick Perkins and Serge Ibaka was Dec. 25. Remember Christmas Day? A blowout over the New York Knicks in Madison Square Garden gave Oklahoma City a 23-5 record, tied for the best in the NBA. Then Westbrook had his right knee scoped, keeping him out of action for almost two months. That was followed by injuries to Sefolosha and Perkins (17 missed games apiece). The Thunder went 6-5 in February, as San Antonio began its surge to the top of the Western Conference and Durant couldn't keep up the supergalactic 36 points per game he averaged in January and reverted to merely stellar. It could have been worse. The two other teams tied with OKC on Christmas Day: the Indiana Pacers and Portland Trail Blazers. That fact alone should remind Oklahoma City fans that even though the Thunder couldn't hold that pace, at least they didn't drop off as drastically as the Pacers and Trail Blazers. And Wednesday night's reunion of that starting five should remind them just how dangerous the Thunder could be in the playoffs. Sefolosha and Perkins average only 10 points -- combined. But, man, the defensive impact. How many other lineups could get away with switching a guard onto Blake Griffin without it resulting in a dunk for Griffin? But Sefolosha wound up on Griffin during an early Clippers possession and Griffin never even got the ball. Oklahoma City's length turned J.J. Redick from a shooter into a playmaker; when he did manage to elude Sefolosha he wound up having to contend with the likes of Durant and Ibaka. Redick finished with eight assists, but shot only 1-for-7 from the field. The Thunder were staunch defenders of the rim, fully aware that dunks are the accelerant that the Clippers use to burn down the house. They contested everything near the hoop, fouling if they had to, keeping Lob City from enjoying its first slam until Chris Paul threw a lob to DeAndre Jordan with 4 minutes, 10 seconds left in the second quarter. "That's [Jordan's] way of getting going," Perkins said. "In the first quarter he was invisible. Then he gets a couple of dunks, he kinds of gets going a little bit. Now he's talking on defense. But if you take away them dunks, he kind of fades away." Jordan and the Clippers never faded away completely, managed to make Oklahoma City sweat out what had been a 17-point lead. But like Kentucky against Connecticut in the NCAA championship game, the Clippers never found the one play to get them over the top, while the Thunder kept providing answers. Paul and Blake Griffin missed fourth-quarter free throws. Meanwhile, Ibaka kept coming up with plays, materializing from nowhere to terminate what appeared to be an open Chris Paul drive to the hoop, or fighting through a screen to get a piece of Redick's last-gasp 3-pointer. Westbrook had a vicious putback slam, in addition to a key offensive rebound born of sheer aggression. "We made the championship-type plays," Durant said. "Rebounding the basketball, Serge contesting the shot. That's what wins you games. Where we're trying to go, that's what you've got to do to win the big games." The Thunder players raved about their communication on defense, how everyone knew where on the floor they were supposed to be and made the right rotations, something that came back to them instantly despite all the time off. It's a lineup we've seen so often since Perkins came from Boston in 2011, a lineup that had been mostly injury-free until Westbrook went down in the playoffs last year. But all the habits, tendencies and knowledge built up over all those games are still there. For instance, "I know that if I see Serge out of the corner of my eye, I'm going to let my guy take a tough shot," Sefolosha said. "I'm not going to reach in or anything like that. He's probably going to go get that [ball]. It's small things, but after a while, it helps." The small things add up. Durant mentioned "championship-type." I wondered, having been so close to it in 2012, what he saw in this group that made him think they can do it. "We have the talent, we have the coaching staff, we have the experience," Durant said. "Guys that [have] won championships, been in the Finals. So it's just a matter of us doing the small things. And tonight, I think we did the small things. We got on the floor, we rebounded, we made big plays down the stretch. We played defense. The shot wasn't there sometimes but we made up for it by our hustle plays. If you do that you give yourself a chance. "I don't know what it feels like to win a championship, but I know what it feels like not to win. The small, detail things we have to do in order for us to win basketball games night-in and night-out. We did that tonight." They're back together. And they're very much in the hunt for a championship. MVP: Russell Westbrook was incredible tonight, doing it all for the Thunder while Kevin Durant couldn't get his shot to connect with his usual efficiency. The electrifying point guard scored 30 points, grabbed 11 rebounds, dished 6 assists, turned the ball over just once and came away with 2 steals in 33 minutes. That was ... a match-up I'd like to see in the playoffs, please: These two teams are playing at an elite level in the tougher of two conferences, and would make for an exhilarating postseason series. Blake Griffin and Serge Ibaka scrappiness. Chris Paul versus Westbrook. What's not to like? Defining moment: Westbrook grabbed two huge offensive rebounds in the closing moments of what turned out to be a tight finish. The first he threw down with ferocity to give OKC a four-point edge with two minutes to go, and the latter was the game-sealing board with 15 ticks remaining. MVP: Damian Lillard filled up the box score with 19 points, 10 assists and five rebounds, none more important than his last, which set up the game winner. Defining moment: Down two with 15 seconds left, Lillard drove, collapsed the defense and found Dorell Wright, who knocked down the corner 3 and put the Blazers up for good. That was ... a narrow, sloppy win. Still fighting for playoff positioning, the Blazers gave out 18 turnovers. Such carelessness nearly negated Portland's shooting advantage (the Blazers outshot the Kings 51 percent to 43 percent from the field). Portland escaped only by the skin of its teeth. MVP: Goran Dragic. The Dragon had 20 points, nine assists and three blocks. He was the steadying force that prevented the Suns from dropping a tightly contested game. He is willing the Suns to the playoffs. X factor: Eric Bledsoe. After missing his first six shots in the first half, Bledsoe went 7-of-7 from the floor in the second half for 16 points. He added six boards, six assists and two crucial steals. That was ... valiant: Missing all but one of their opening day starters, the Pelicans played tough in a game that came all the way down to the wire. New Orleans' bench scored 53 of 88 points. MVP: Luis Scola gave the Pacers a focal point on offense: a player who could both draw a double-team in the post and hit defense-stretching shots on the perimeter. He scored a game-high 24 points on 11-for-17 shooting. Defining moment: Ian Mahinmi fouled Khris Middleton on a 3-point attempt with 4.9 seconds left, and Middleton made all three free throws to tie the game at 102. Chris Copeland countered for the game winner. He caught an inbounds pass, drove right and floated in a shot over Ramon Sessions. That was ... just as interesting off the floor: The Pacers rested all five of their usual starters with a game in Miami looming Friday. The Bucks activated Larry Sanders and started the timetable on his five-game suspension with five games left in the season. MVP: Zach Randolph started the game 8-of-8 from the field in the first quarter, setting the tone early for Memphis. He finished with 25 points on 12-for-15 shooting and 11 rebounds. Big night from Randolph with his team desperately needing a win. X factor: Mike Conley showed why he is so valuable to the Grizzles, creating offense when there wasn't any and getting everyone involved. He hit a few huge shots down the stretch and provided Memphis with another offensive option to complement Z-Bo. 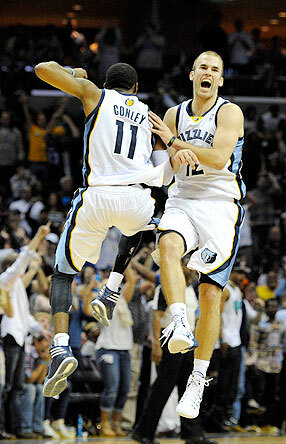 Conley finished with 26 points and six assists in the Grizzlies' win. LVP: Chris Bosh. With D-Wade out and Chris Andersen and Udonis Haslem also sidelined, the Heat needed some increased production from Bosh, and he didn't deliver. Bosh spent a lot of time hanging around the perimeter, and didn't establish himself as a second offensive option to James. He finished with 13 points and only six rebounds in 35 minutes of action. MVP: Jonas Valanciunas scored a career-high 26 points on 10-of-14 shooting and grabbed 12 rebounds. He dominated every big on the Sixers' roster and accented his performance with a few thunderous dunks. X factor: Kyle Lowry showed no signs of rust in his first game back from a knee injury, as he dropped 29 points, grabbed five boards and dished out eight assists. He scored on four consecutive possessions down the stretch to seal the victory for the Raptors. That was ... very impressive: Michael Carter-Williams was highly effective for the Sixers, especially with his ability to push the tempo and operate in the pick-and-roll. He scored 19 points (7-of-12 shooting), snagged nine rebounds and handed out eight assists. A very solid night from the likely rookie of the year. MVP: Was that Randy Foye or Chris Paul out there? Foye had 22 points in the third quarter and 30 overall. And let's not forget his 15 assists with just one turnover, or how he hit a layup late to ice the game. That was ... too little, too late: With Denver leading 110-88 in the fourth, Kevin McHale waved the white flag by putting in his bench players. But Houston's bench guys hustled and made big shots to cut the deficit to four before running out of time. X factor: Energy and hustle. Denver had numerous possessions where Kenneth Faried or Timofey Mozgov would just run the length of the court, post up under the basket and dunk. None of the Rockets' bigs could keep up in this track meet. MVP: Joe Johnson (31 points) did everything he possibly could to help the Nets steal a win in Orlando after trailing for most of the night. He was nearly automatic in crunch time, except on his game-tying 3-point attempt. Defining moment: Trailing 112-109 with 13.6 seconds left, Johnson tried to tie things up with a 3-pointer but he was blocked by Kyle O'Quinn -- the Magic's best shot-blocker. The game became a foul-fest after that. That was ... a lot of 3s! : It wasn't J.R. Smith shooting an NBA-record 22 3-pointers against the Miami Heat on Sunday, but it was still funny to watch Mirza Teletovic (17 points on 5-of-17 shooting) chuck up 12 3-point shots with no remorse. MVP: Spencer Hawes only played 19 minutes, but his hot start put this game away early for the Cavaliers. His 13 points in the first 8 minutes helped the Cavs build a 10-point lead that stayed in double-digits for the rest of the night. Hawes put up 15 points and eight rebounds when the outcome of this game was still in question. LVP: Like several other players, Brandon Jennings scored some points when the game had already been decided, but he started off 1-for-7 and had several careless turnovers that helped Cleveland get their lead up to as much as 32 late in the first half. That was ... quite a trio: The Pistons are the ones known for their frontcourt, but tonight it was the three-headed monster of Hawes, Tyler Zeller and Anderson Varejao who dominated the paint and the glass, scoring 44 points on 27 shots, while pulling down 26 rebounds. MVP: The Bobcats consistently make it tough to identify any one player as the most valuable. Al Jefferson had 20 points and 18 rebounds and Kemba Walker whittled a masterpiece floor game from a poor shooting night, but this award has to go to Steve Clifford. He's technically ineligible, but he has made all of his players more valuable than they might otherwise be. X factor: Washington spent enough time in the paint to color a barn, winning the war down low 50-28 with huge efforts from Marcin Gortat (27 points) and Trevor Booker (16 points). But the Wizards, one of the best 3-point shooting teams in the NBA, also shot 1-for-15 from deep compared to Charlotte's respectable 11-for-25. Defining moment: With the game (and the 6-seed) slipping away, and the Wizards failing again and again to find a good shot, the crowd in Washington waited for a moment that never came: a timeout from Randy Wittman. The Wizards flopped feebly like so many trout in the ice cooler of overtime, and the Bobcats outscored D.C.'s team 7-1 in the extra frame. MVP: With Boston threatening to pull away in the fourth quarter, Jeff Teague went on a personal 5-0 run -- draining a 3-pointer, grabbing a steal and throwing down a two-handed dunk. Teague finished with a team-high 19 points and eight assists. Turning point: With 3:42 remaining in the fourth, Kyle Korver banged home a 3-pointer to give Atlanta a 90-89 lead. Jared Sullinger answered with a trey, but the Hawks pushed the ball and got Korver another clean look from behind the arc. This was part of a 19-3 run by Atlanta. That was ... good for both teams. With the win, Atlanta's magic number became two -- two wins for the Hawks or two losses for New York (or some combination thereof) will put Atlanta in the playoffs. Meanwhile, Boston tied Orlando for the third-worst record in the league. MVP: Joakim Noah knows the dish now. His 15 points, 13 rebounds and 10 assists gave him his fourth triple-double, moving into a tie with Indiana's Lance Stephenson for the most in the NBA this season. X factor: D.J. Augustin continues to scorch the nets off the bench. He sank 4-of-7 3-pointers en route to a game-high 21 points in 30 minutes of action. This is ... a race for third: The Bulls and Raptors are now tied for third in the East, with the tiebreaker going to the Raps and only five games to play. The Bulls' best hope might be the Knicks showing some fight in their two remaining games with the Raps. 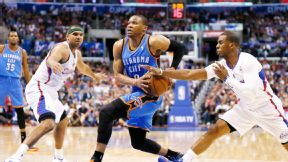 Russell Westbrook, Thunder: Westbrook had 30 points, 11 rebounds and a huge putback dunk that helped the Thunder fend off the Clippers 107-101 in a possible playoff preview. Westbrook, who has missed 34 games this season with a variety of injuries, had sat out two of the previous three games. Trevor Ariza, Wizards: Laid low by the flu, Ariza spent 39 miserable minutes on the court of the 94-88 overtime loss to Charlotte, missing all six of his shots as the Wizards dropped to the No. 7 East seed. "The way we play right now, we ain't going to beat anybody, including Milwaukee." -- Wizards center Marcin Gortat, whose team lost to Charlotte and fell to the No. 7 seed. Justin Ford-USA TODAY Sports Mike Conley and Nick Calathes helped the Grizzlies beat the Heat and stay in contention for a West playoff spot. With all five of the Indiana Pacers' starters watching from the bench, Chris Copeland hit a tiebreaking layup with 1.2 seconds remaining to give Indiana a 104-102 victory in Milwaukee. That was the first time in Copeland's two seasons that he even attempted a potential go-ahead field goal in the final 10 seconds of a game. The last Pacers player before Copeland to make a game-winning shot in the final 10 seconds of regulation was George Hill in November 2012 against the Lakers. Roy Hibbert, Paul George, Lance Stephenson, George Hill and David West have played more time on-court together this season -- precisely 1,432 minutes, 21.6 seconds -- than has any other five-man unit in the NBA. In fact, only four other teams (the Trail Blazers, Timberwolves, Mavericks and Warriors) have used a particular five-man unit on-court together for even half as much time as the Pacers' quintet has logged.